This month the wonderful Dom of Belleau Kitchen has teamed up with Karen of Lavender and Lovage and Kate of What Kate Baked. The plan is to combine his Random Recipes challenge with Karen and Kate’s Tea Time Treats. This is a grand plan as far as I’m concerned: having been away on holiday for the first part of September, I have even less time than usual to fit these challenges in, so two combined into one suits me perfectly. The idea is to pick a book that you think most represents tea time treats and then pick a random recipe from it. Following Dom’s lead, I took the two baking books that had British in the title from my bookshelves: British Baking by Petyon and Byrne and The Great British Bake Off by Linda Collister. CT did his usual trick and randomly selected one of them. GBBO it happened to be and page 189 was the number he picked, giving me Fennel and Ginger Chocolate Tarts. I was intrigued by the idea of incorporating fennel and slightly concerned it might overpower the tarts, but very willing to give it a try. The pastry part of it, I was less thrilled about: I have yet to grow into enjoying pastry making. Weighed 30g spelt flour and 150g plain white and poured into a bowl. Threw in 100g of cold unsalted butter and cut it into small pieces with a knife (the book said to cut into pea size peices with two knives, but I didn’t understand what was meant by this and also didn’t have the patience to cut it quite that small). Rubbed butter and flour between my fingers until the mixture resembled breadcrumbs. Added an egg yolk and 1 1/2 tbsp cold water. Stirred this in with the knife, then brought the mixture together with my hands to form a ball. Placed this in the fridge for 1/2 an hour. Rolled the pastry out to about 2 mm and cut into rounds to fill four 9 cm tart tins and 4 foil cases of varied size (eight 9 cm tart tins would probably be just right). Pricked the bottoms with a fork and baked at 180C for 10 minutes. Ground a pinch of fennel seeds with a pestle & mortar (the recipe said to put them in whole, but ours were home grown and rather large and I preferred the idea of having them ground). Chopped 20g crystallised ginger into slithers. Melted 100g unsalted butter with 100g soft brown sugar. Simmered for 3 minutes then added 100g double cream. Continued to simmer for a further 4 minutes. Added 100g broken dark chocolate (G&B 85%) and stirred until smooth. Stirred in the fennel and ginger. Poured the ganache into the pastry cases and left to set. These proved to be very popular with CT, who claimed they were the best thing I’d made in a while, not he hastened to add, that he hadn’t enjoyed everything else. I was particularly pleased with the pastry cases, which were firm and crisp without being hard or solid. Having no added sugar, they were a good foil to the sweet fudgy filling, which really was rather mouth-watering. The filling was easy to make and set to a nice firm yet smooth and soft consistency. Thankfully, the fennel was subtle but still discernible against the warmth of the ginger and the two flavours came together gave an interesting but welcome synergy. They look sensational. I would never in a hundred years thought to put fennel in a chocolate tart. OMG fennel?? Sounds yummy! I’ll give it a go. CT’s comment is hilarious and sounds so like my husband – ha ha! 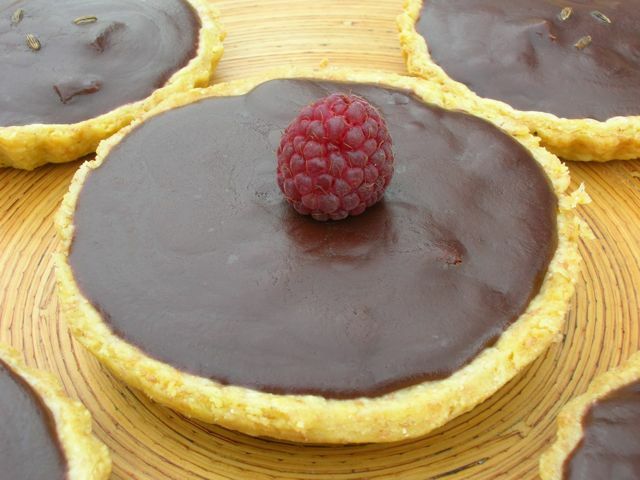 I love the sound of these tarts, a really interesting combination. They look totally lovely deliciously yummy I want one like! When I saw the title I thought it would be fennel bulb! But this sounds much better. Wow, what an amazing combination. And I am very impressed that you have homegrown fennel seeds. What gorgeous little tarts! I love the combination of ginger and chocolate and I’ll bet that pinch of fennel adds even more warmth. That sounds quite unusal but I’d love to try it. Would never have thought of putting fennel and chocolate together. The tarts look delicious. They look so good, who ever thought of putting fennel and chocolate together?? Clever little so and so that they are, perfect for a little something with the afternoon cuppa I imagine. That last photo of the cut one is heavenly! They look great – I particularly like the sound of that tart filling and the consistency you describe. I’m not sure I’m keen on fennel, but ginger, yes please! James Martin had a chocolate cake recipe with a fennel bulb in it if you want to explore the combination further and if you google there’s also a recipe by him for baked chocolate mousse cake with candied fennel. I’m not trying to promote JM, but my brain remembers peculiar things, and the fact that he had done a fennel/choc combo is one of the facts it deems worthy of brain-space….. They look beautiful and sound delicious. I love the ginger part and I am convinced about the fennel. I wonder if Mr OC would be as convinced though…. Very interesting choice of flavours! It must have been difficult to get the balance right with those. Sounds delicious. These sound just that bit different but in a good way. They do look lovely. I share lack of excitement on the pastry making front. It’s good when it works but…. What an intriguing flavour combination – sounds really delicious and looks beautiful – very sophisticated. Another superb recipe idea. Perfect for a chocolate lover like me. Thanks so much. Fennel is quite unusual to see in a tart – excellent idea. These look great! I bet the fennel adds a nice touch! We have a wild fennel plant that I need to use more often. Thanks Debi, it’s not obvious, but fennel does go very well with chocolate.